In the main event of UFC 215, flyweight champion Demetrious Johnson looks to break the UFC's record for most consecutive successful title defenses against Ray Borg. In his last fight, Johnson tied the record held by Anderson Silva with his 10th title defense in a victory over Wilson Reis. As Johnson looks to stand alone in the annals of UFC history, we're taking a look at the statistical categories that could end up being the difference between whether or not he can get the job done on Saturday night. The first metric that really jumps off the page for this fight is the striking differential. Both fighters are above average in terms of striking defense, as they both absorb only 1.71 significant strikes per minute, but Johnson is far and away a more effective offensive striker. He lands 3.49 significant strikes per minute, which leaves him with a 1.78 striking differential. On the other hand, Borg lands only 1.51, which gives him a -0.20 striking differential. In order for the challenger to pull off the upset, he will need to find a way to be offensive without engaging in a striking battle. Borg has the ability to take advantage of dominant positions on the ground as a dynamic submission threat. He will need to rely on that in order to be successful in this fight. On top of not being a very active striker, Borg is also limited when it comes to where he does most of his striking. In his UFC career, he has landed 136 significant strikes; 81 of those strikes, or 60 percent, have come on the ground. Johnson is not a stranger to ground fighting and often turns to his wrestling in tough situations, but he has landed only 11 percent of his significant strikes on the ground. If the champion can find a way to keep this fight on the feet, he should be able to dominate with his striking ability. Borg is an effective and persistent wrestler. He finishes only 47 percent of his takedown attempts, but he still manages to land 3.16 takedowns per 15 minutes of fight time. He will have a tough time taking down Johnson. In his combined UFC/WEC career, Johnson has defended 64 percent of his opponents' takedown attempts. 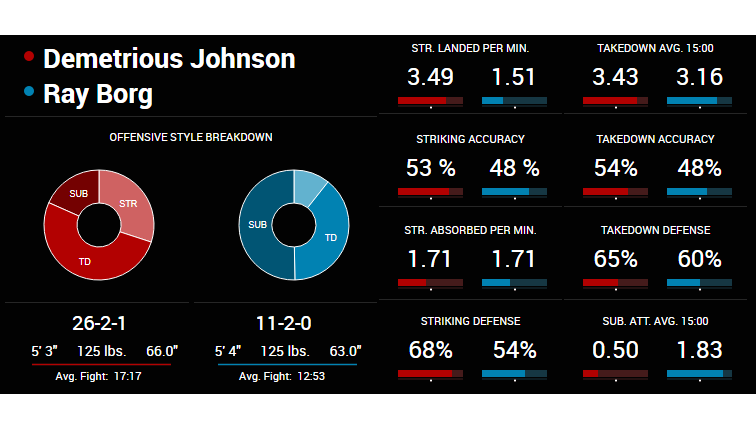 In those 19 fights, Johnson has been taken down 40 times, which equates to 1.83 takedowns allowed per 15 minutes. Those numbers are also a bit misleading. Before the UFC added the flyweight division, Johnson competed as a bantamweight. Being a smaller fighter made it tougher for him to stop takedowns. In his six fights at 135 pounds, he allowed 24 takedowns, but he has become far more effective since moving down to 125 pounds. At flyweight, Johnson has allowed only 16 takedowns, or 1.04 takedowns per 15 minutes. Borg's style demands that he score takedowns and work from on top. That will not be an easy task on Saturday night. This will be the challenger's first fight scheduled for 25 minutes in the UFC. Despite that, Borg is not a stranger to long fights; he has gone to decision in five of his seven UFC fights. His average fight time is 12:53. That being said, a longer fight almost certainly favors the champion. Johnson has fought all five rounds six times in his UFC career; his average fight time is 17:17, and he has a penchant for scoring late finishes. Four of Johnson's seven finishes in his UFC/WEC career have come in the third round or later. Johnson's submission over Kyoji Horiguchi at 4:59 of the fifth round is the latest finish in UFC history. Borg is not a dynamic finisher, so it might be worth it for him to go for broke early. As the fight goes longer, it will almost certainly swing things in favor of the champion.